Simple design, just two main parts. 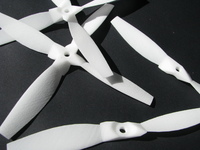 Uses a FLF 3 Evo Cleanflight FC with integrated FlySky receiver, works great with the cheap and competent Turnigy 9X. Print and Clean, insert FC in the lower part and snap into large frame and youre done, attach battery pack using a rubber band or similar. EDIT: added an optional battery tray for the battery packs listed below. Print, Solder motors to FC, Bind TX, Calibrate FC, Connect battery and fly.